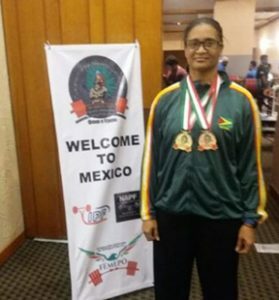 Two times gold medalist Nadina Taharally, 45, mother of two and grandmother of two, in an interview said that gym has the potential of being a major recreational facility given the challenges facing communities for space, maintenance and resource upgrading. Taharally, Vice President of Power Lifting Federation, also works as a trainer at Interline Fitness Gym, consistently calls for the support from non-governmental organisations, government and international bodies to support gyms, particularly women whose career and health are the nation’s wealth. She went on to say that, Guyanese have great potential to make centre stage and become role model for future generations, as she did but are not financially equipped to meet expectations. Several efforts and calls by her on behalf of the federation went ignored. More and more women are documented joining the power lifting federation and much needed help is paramount even if it is support from employers. Nadina Taharally was the first Guyanese athlete to compete in the Raw Masters 1 category. She had a best Squat of 130 Kilogram, Bench Press of 65 Kilogram and a 160-Kilogram Dead lift.